and the PATH are quite common. A simple explanation of what PATH mean to the OS, as well as simple guidelines on how to set and read them accordingly are rightly shown in this Mac OS X Change $PATH Variable Guide. We usually use iTerm2 instead of Terminal. It really does not matter which Terminal Program you are using (You can read about Terminal here). 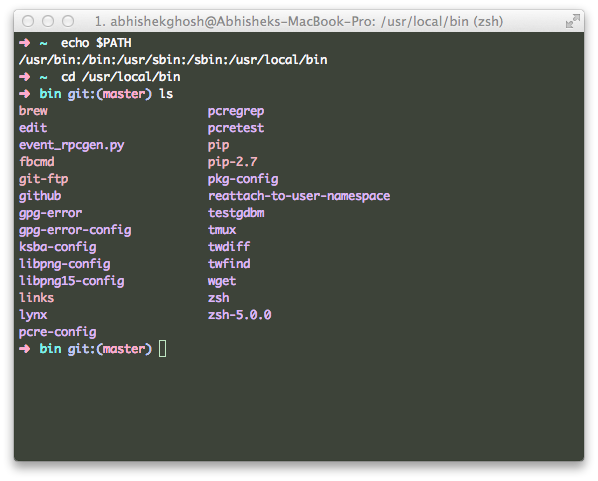 For example, while using make Command on OSX to Compile Application, we need the PATH. Environment Variables in Linux are prefixed with a dollar sign ($) such as $HOME or $HOSTNAME. Many well-known and standard variables are spelled out in capital letters to signify just that. Keep in mind that variable names are case sensitive meaning that $User and $USER are entirely unrelated from the shell’s point of view. Unix derivatives define system wide variables in shell-scripts located mostly in the /etc folder, but user-specific values may be given to those variables in scripts located in the home folder (e.g /etc/profile, $HOME/.bash_profile). The .profile file in the home folder is a common place to define user variables. In OS X, hidden files are those which starts with a period – .profile or .bashrc can be examples. You can not open them in GUI (i.e. from Finder). Vim is the text editor which is known as vi in command line tools. Irrespective of what Terminal application (iTerm2 or Terminal) you are using, you can open then in vi and edit. Package Manager or Package Management System allows a convenient management of software, which exists in packet form on Linux or UNIX Like operating system. Homebrew Handy Guide Provides an Easy To Understand Manual For the OS X Homebrew Package Manager Users in Plain English. Paper Folding Animation for iOS control allows hiding of views on the left and right side of the screen by dragging the middle view. Here are the URLs of some commonly used Mac Apps, so that the users can wget or cURL from command line. Apps include Skype, VLC like softwares. Cite this article as: Abhishek Ghosh, "Mac OS X Change $PATH Variable Guide," in The Customize Windows, November 22, 2013, April 21, 2019, https://thecustomizewindows.com/2013/11/mac-os-x-change-path-variable-guide/.